Tonga Proud of Its First Roman Catholic Cardinal | Stamp Fun! On 14 February 2015, Pope Francis of the Roman Catholic Church made Tongan history by elevating Soane Patita Paini Mafi to the office of Cardinal, the first such from the South Pacific island Kingdom of Tonga. At the same time, Cardinal Mafi became the youngest member of the College of Cardinals, the body that elects new popes, among many other duties. So proud of their native son, Tonga Post marked the event by releasing three commemorative stamps plus a souvenir sheet sporting a fourth stamp a year ago this month on 1 April 2015. The three single stamps issued in panes of 25 for each value include a $2.25 commemorative which portrays a serious Cardinal Mafi waiting his turn to greet Pope Francis on the day of his investiture, a $2.70 stamp featuring a smiling cardinal and the $5.00 stamp which depicts Pope Francis at the outdoor event in Vatican City’s St. Peter’s Square. The fourth stamp in this commemorative series forms a souvenir sheet and is valued at $8.50. All denominations are in Tongan pa‘anga, which is currently worth about half a United States dollar. 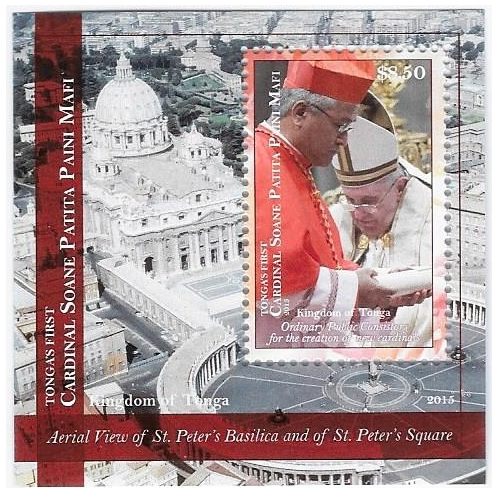 An aerial view of St. Peter’s Basilica and of St. Peter’s Square appears in the background of the souvenir sheet. While flying from Auckland, New Zealand, t0 Nuku‘alofa, Tonga, recently, I noticed that Cardinal Mafi and two assistants were aboard. He really is as young as he looks on these stamps and appears to have a long and fruitful ministry ahead of him. These stamps certainly qualify for religion, Catholic, cardinals, Pope Francis, popes, Vatican City and St. Peter’s Basilica and Square categories when forming topical or themed collections. Topical collections are very popular among philatelists. Apart from that, the Cardinal Mafi commemoratives are brightly colored and will make a nice addition to your collection, whether you collect by country, by topic or by whatever strikes your fancy. The Kingdom of Tonga has a population of about 105,000 and is spread over 700,000 square kilometers of the South Pacific Ocean. It’s inhabitants speak Tongan, a Polynesian language; many Tongans are also fluent in English. Both Tongan and English are official languages in the Kingdom. Tongans live on about 40 islands out of a total of some 170 and rely on agriculture, fishing and tourism for their livlihoods. I’m surprised that stocks of the Cardinal Mafi commemorative stamps are still available at essentially face value a year after their release. Add these to your collection at your favorite stamp dealer, find a stamp dealer or click here to order directly from the official Tongan philatelic agency in the USA. This entry was posted in New Issues and tagged Auckland, Cardinal Mafi, College of Cardinals, English, Kingdom of Tonga, New Zealand, Nuku‘alofa, Polynesia, Pope Francis, religion on stamps, Roman Catholic Church, Soane Patita Paini Mafi, South Pacific Ocean, St. Peter's Basilica, St. Peter's Square, Tonga, Tonga Post, Tongan, topical collecting, Vatican City. Bookmark the permalink. Stamp Fun! brings you news from the amazing world of postage stamps, including new-issue announcements, how-to tips and all things philatelic. Stamp Fun! is the renaissance of David Tilton's award-winning, weekly syndicated newspaper column "Stamps," updated for the internet-age.